Question. Do you think all of these are blushes? They are NOT! It says box o' blushes on the front, but not all of them are blushes! Is that a tongue twister? 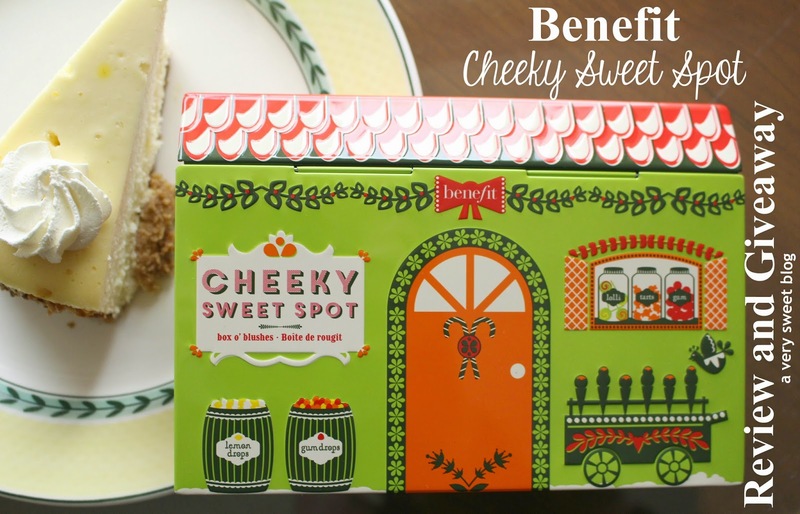 LOL The Cheeky Sweet Spot Box O' Blushes Holiday Set by Benefit ($36 OUT OF STOCK at Benefit, Macys, Boots, Sephora) contains a bronzer, highlighter, all over face brightener, brush AND blushes! It comes with a cute little booklet, that explains them all AND DO NOT DO LIKE ME and toss the booklet to the side! LOL READ IT MY PRETTIES! LOL I knew something was wrong when I kept applying layer after layer of Dandelion and it didn't produce much color. I was like WTF am I doing wrong?...I DO know how to apply BLUSH! I picked up the book and found out it's an all over face brightener :) Another thing! You are suppose to start off either BRIGHTENING (Dandelion) or BRONZING (Hoola), THEN use the others! Or you could just Watts Up (HIGHLIGHTER) and be done with it. LOL This set has one little brush for application. So you most likely will need your other makeup brushes. Super cute dimensional tin packaging with magnetic lid closing. 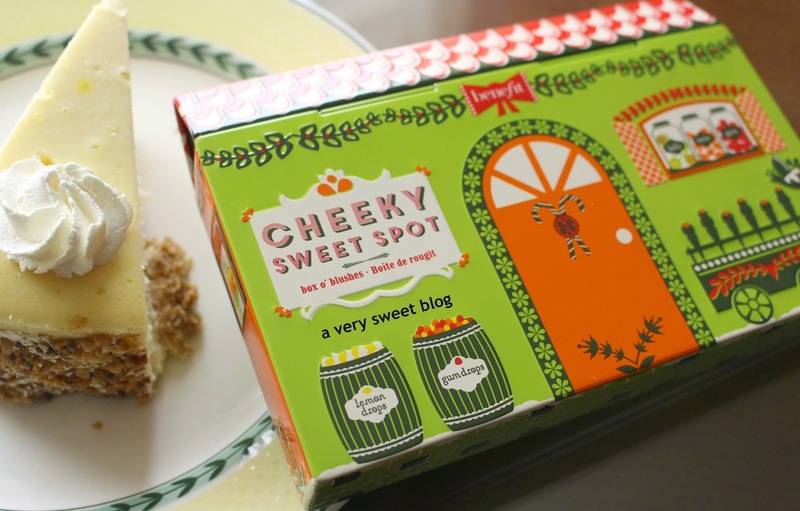 It's charming and comes covered with lemon & gum drops, lollipops, tarts, gum, candy canes, ice cream cones, ALL in a cute Sweet Shop inspired setting. There's countless reviews on this, so I'll stop here. I love them all! The only one I need to work with is Hoola. I'm really fair, so it comes off dark on me. Maybe I should use a lighter hand. This is an excellent way to sample Benefit's "blushes" or "box of powders". I have an extra one of these beauties waiting on a lucky reader. See, I'm not CHEEKY ;) This giveaway is open WORLDWIDE (well anywhere USPS ships) and again, I'm not responsible for any adverse skin, health or mental reactions upon using this product. Use the Rafflecopter widget below! Good Luck! Oooh! Do you see the label in the picture above? There must've been a manufacturing printing snafu! I love the packaging <3 <3 All those shades are really beautiful, I'm sure they will look great on you Kim!! Very nice packaging and the shades are really pretty! I see the snafu you were talking about! I wonder if Benefit was upset lol! I agree they did a good job covering it up! This has to be my favourite Benefit kit in years! No I haven't tried them before. Never tried but I want to! Ive never seen this product before! The packaging is so cute AND the blushes actually look amazing. What a cute package nice giveaway doll. I would have thought it was all blushes too! I tried Watts up and it seemed pretty cool. I need to try it again. The swatches look great on you! I haven't tried Benefit's Blushes or Powders but this package looks awesome! The packaging is sooo cute! And no, I have never tried Benefit blushes and powder. I have tried the concealer, highlighters and mascaras but somehow never pick up the blushes. Fingers crossed though, the swatches looks amazing, Kim! This is so cute!! I love hoola and my favorite blush is rockateur. I love Coralista too!! I totally thought dandelion was a blush LOL. I'm so pale I could probably use it as one haha!!! I need to find this palette somewhere. I had a whole plan to buy it when I will be in New York next week but it seems to be sold out everywhere. :( Any ideas? 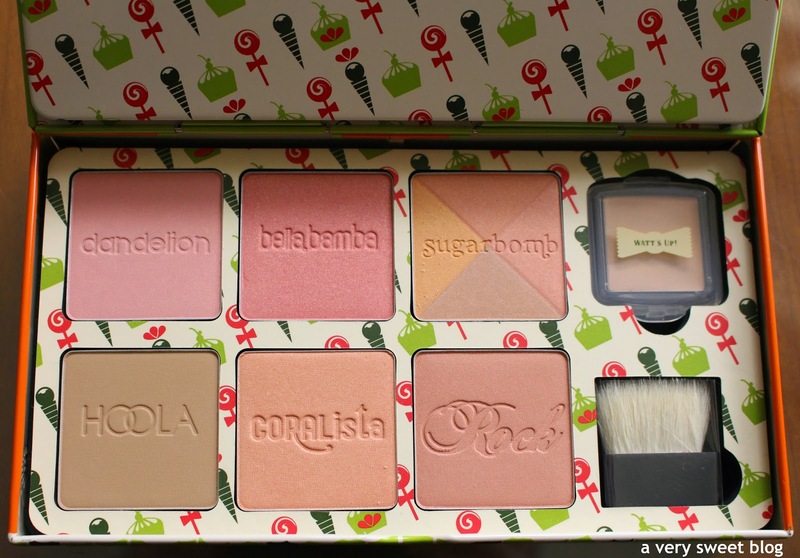 Benefit has the cutest packaging and this set contains the prettiest colors! Thanks for another fun giveaway Kim! I have tried many benefit products but not their blushers or brushes. Thank you for the giveaway! I've tried Benetint and love it. If I had the money I'd be buying everything of Benefits I love their cosmetics. Also, I think the pictures you took for this post are really awesome. What a cute kit! Love the entire packaging. I haven't tried them yet, but I would love to! I haven't tried the blushes yet, but I've been searching for the perfect color for my super pale skin. This palette would be a good opportunity to try a bunch! o la la awesome set! i have nevre tried benefit .... yet? I never have bought something form benefit. I like cute product packaging, but I find that benefit is too much for me. It's just not my cup of tea. I hope I don't sound like terrible, but that's just true, I don't like their packaging. I like the dessert you have next to the blushes! haha. I love Benefit products but I have to say, I'm really not a fan of the packaging - the cardboard is cute but it's not at all durable. I've broken so many of their blushes that I've given up now. Which is a shame, because this set looks really fun. No, I havnt tried Benefit products yet. Thanks for chance to win this one. Lubka K.
I haven't tried them before, but they all look so great! Kim, you sound just like me. I never read the details too! Lol. Lovely product! I've never tried their products! I am a fan of Benefit blushes! this looks like an awesome holiday kit, Kim! Lovely package!! Love the shades and thanks for the sweet comment on the blog. No I haven't but they look fab ! I havent yet but I would love to. I never knew which color blush I should actually be wearing. I have just tried to Hoola Bronzer and am obsessed! Oooohhhh. The packaging looks so cute! And it's perfect for your sweet blog. Hihi. I've never had the chance to try them, but would love to. I never tried them...your review is great..and fantastic swatches! Such a cute tin! 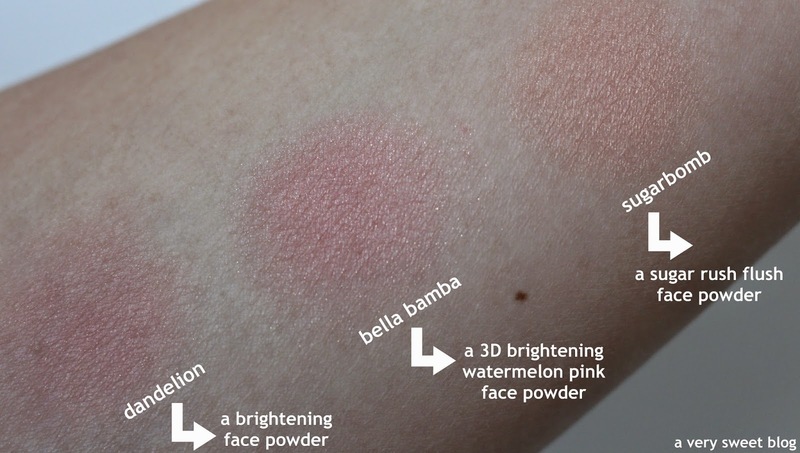 I wish I knew more about blushing/bronzing (or is it blushing vs. bronzing?). i had the hoola bronzer on my to-try list forever...then i went to sephora and the color didn't even show up on my skin. but i've seen so many youtubers use it for contouring and i'm just convinced it's the perfect color. i may need to purchase anyways!